Item for fastening: lightweight construction such as drywall tracks, furring, scantling, sheet metal, plates, baseboards, roof profiles, scrids, wood furring, wall cladding profiles and plaster profiles for connection "end- to-end”, cable clamps, pipe clamps and so on. Specifics: Screw should be used in combination with dowel only. The dowel should have the appropriate diameter. Screw will pass through inner passage of dowel quickly due to special form of thread. Screw doesn’t damage the internal thread turns in dowel passage. As a result, the screw can be easily unscrewed from dowel (e. g., if the construction should be dismantled). Reinforced base of screw head withstands a high impact load, and firmly fastens a screw in a dowel after installation of the construction. Advantages: Installation work can be performed very quickly when screws with impact thread are used. As a result, the total period of construction can be decreased. The special equipment such as screwdrivers or electric tool isn’t required in this case. 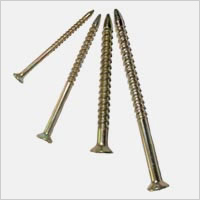 Impact installation of screws and possibility of unscrewing is the unique characteristic of such screw (advantages of a nail and ordinary screw are integrated in impact screw). Screw should be used in combination with dowel only. The dowel should have the appropriate diameter. Screw will pass through inner passage of dowel quickly due to special form of thread. Screw doesn’t damage the internal thread turns in dowel passage. As a result, the screw can be easily unscrewed from dowel (e. g., if the construction should be dismantled). Reinforced base of screw head withstands a high impact load, and firmly fastens a screw in a dowel after installation of the construction. Screw should be used in combination with appropriate diameter dowel only. Impact thread has special form. © 2002 OOO ROST. All Rights Reserved.